Thanks to the excellent and informative 2017 Design Summit and the presentation by Eric Berg on worksheets I decided to try and modify one of my very dumb worksheets into something that can query referenced files and extract data not only from a parametric objects (a hardscape in the case) and an attached record (pavement). My issue or challenge is two fold. The worksheet criteria does show the desired number objects so long as I have (record - Hardscape) in the list of criteria. If I remove this it does not show the same quantity of objects with the other criteria (record - Pavement) even though the same 17 objects have "pavement" record attached. The second part to this is that I want the worksheet "database" to pull data from both the hardscape object and the additional record "pavement" in one materials schedule. I want to not only have the available info from the hardscape but additional information in the "pavement" record to populate the worksheet as shown. I have as shown the "pavement" record and the field that I'm looking for selected however it does not fill in this information. Am I missing something or am I trying to do something that isn't there yet. I do worry that the answer to this is to move to Project Sharing, which was also a very informative presentation by Rubina Siddiqui however we aren't there just yet. As a wish item, it would be great if you are using referenced viewport as a search option that a user would be able to find the object even though it is referenced. You should be able to do what you want. You can pull data from different records into the same database. It is just a matter of using the correct formula. The Database Criteria only selects the objects for the database. The actual data you display can be anything. By putting in two type of the same condition you are actually setting up an OR condition so the database will contain every object that has the Hardscape record OR the Pavement record. That is what the vertical bar between the two in the criteria means. If all of you objects are truly going to have both records attached, you don't need to include both in the criteria. Also, I don't think you can attach the Hardscape record to a non PIO can you? If not, you don't need the first criteria. Once you have the criteria right, you can put whatever formula you want into any column. ='Hardscape'. 'Field 1', ='Pavement'. 'Field 33' The worksheet does not care. It will look at each object and attempt to pull the data from that record. If the record does not exist for that object (I think) it will just ignore it and return a blank. If it returns N/A or something else you may need to wrap the formula in an IF statement to get it to display what you want when there is missing data. It may be that in the new pulldown database headers that you will have to manually edit things instead of just using the pulldowns. Can you upload a simplified version of the file so we can take a look? Thanks for the timely response. 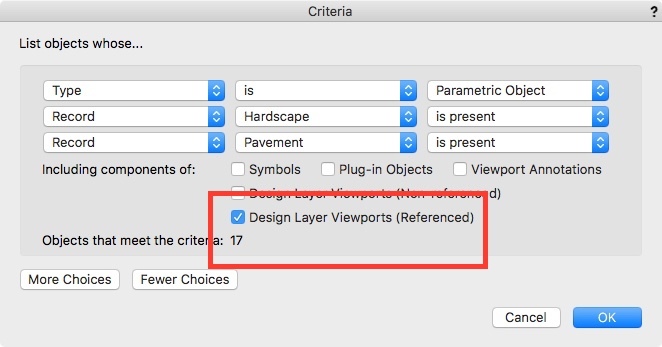 I wasn't aware of creating an OR condition; however it I remove the "record is Hardscape" the criteria dialogue is blank, even though there is a record "pavement" attached. As far as a modified file what would that look like since we are talking about referenced files here. A stripped down version with only the hardscape parametric objects perhaps? Again thanks for the timely response. For the attached file, let's start with the simple version. Just a few objects with the two records attached and the worksheet in its current state. If we can get it to work on a single file, we should be able to make it work on referenced data. I tested the worksheet in the referenced file directly and everything works as expected. Great. 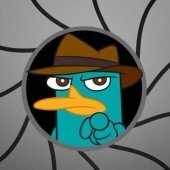 If you need more help ask again. I indicated that this works by what you suggested. I brought the worksheet into the referenced file and the worksheet showed all records; however, it does not work with the worksheet querying the referenced file. Is your Pavement record a custom record format that is just attached to the hardscape objects? It appears (both in my tests today and in the forum search) that worksheets have the ability to see PIO records from referenced files, but not to Custom Record Formats from referenced files. It does not matter seem to matter if you have a copy of the record format in the referencing file or not. I will keep playing and see if I can find anything, but it appears that you are our of luck. How are you doing your referencing? Are you using Design Layer Viewports? Or are you using old style layer references? With old style layer references it will work. With just DLVPs, it won't. I rushed to answer earlier. Thanks again for all your time and effort. to answer your questions: Yes it is a custom record attached to the hardscape. I am using DLVP as this is the recommended option for references. Again this goes to the idea that the best way to do this is with project sharing rather than our old workflow. It looks like worksheets not seeing custom record formats is a long term issue based on the history I have read. I will enter yet another bug/enhancement request and maybe it will get fixed. I had written a long work around and then realized it only worked until you updated the reference. Not a very good work around. Only feasible if you can recreate the viewports without much work, so no overrides, special crops, etc. otherwise too much work to recreate. Thanks again. I will see about using records attached to keynote labels as an alternative. I appreciate all your time and effort. Seems as though this should be an improvement; however I think the direction for VW is going to be everyone is on project sharing and you don't need references. Most of my projects that use references are done so we can divide work to one user doing layout, another doing plating and so on. I found this topic because I still need references and I was trying to put together a seating count worksheet based on symbols with a particular custom record attached in the referenced file. Unfortunately, no matter what I try, I can't get this to work. It sure would be nice, since I get a lot of files from the scenic team referenced in, but would like to do a worksheet for certain symbols in the master project file. Just tried this again in VW2018. I still can not find a way to access data in referenced records. I can see the objects by Type, but not by record. I agree this should be fixed/added. Cris, If you are able to get into the master file, you can create one big symbol with all your seats and bring it into your file as a referenced symbol. A worksheet in your file should be able to access the data this way.